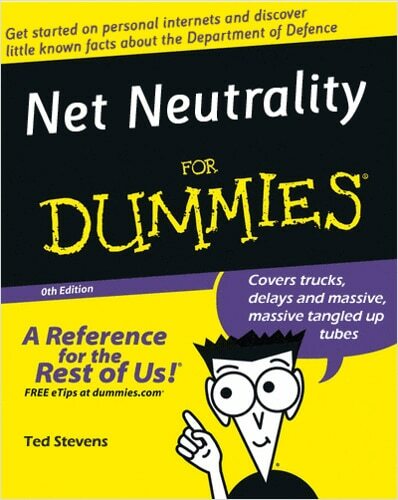 Just about 4 years ago, I wrote on these pages about the struggle to protect the internets and some proposed legislation that was threatening the many small businesses and startups who depend on cyberspace to do business, feed their families, and assure that their employees will continue to be paid. Four years later, much to the relief of small internet businesses the world over, great progress has been made and the issue has been settled. Wait, what? I meant to say, that five years later nothing has changed, the status quo remains, no long-term protections have been put in place, our politicians continue to lock the net-neutrality-grid, huge corporations continue to fight for their own interests and against those of the average, everyday consumer of digital goodness. In other words, things are humming along as usual in Washington DC! But. A small glimmer of hope has appeared, because this month Tom Wheeler, the chair of the Federal Communications Commission, which is the agency charged with regulating all things having to do with interstate communications, detailed a proposed a new set of rules that would allow the FCC to regulate the Internet just as they do other public utilities, such as television, radio, telephone companies. Those opposed to Chairman Wheeler’s new proposal make the same arguments that they have made decade after decade every time industry regulation has been strengthened to the benefit of consumers and users of the regulated services: “Companies will have less incentive make investments in technology and innovation.” “Consumers will pay higher prices because of regulatory requirements.” “Washington will micromanage the entire industry.” Interestingly, history has proven these arguments to be wrong time and again. A recent example of these histrionics came over proposed regulation of the mobile phone industry; the same arguments were trotted out, the same “sky will fall” predictions made, yet the consumer protections embodied in those regulations did not lead to anything other than massive growth in the wireless communications market. For instance, between 1995 and 2008 the market for cellular subscribers grew from 25 million to over 298. million. The industry has remained wildly profitable for the carriers, and as anyone who owned one of the early ’90s “brick” phones can attest, Title II regulation of mobile phone services has not slowed down either investment or innovation nor has it led to less choice or higher costs for consumers. Like cell phones, the Internet has become an essential public service, and some degree of regulation is necessary to protect consumers. The public’s safety and welfare are dependent on easy access, a level playing field is required to encourage fair competition, and Chairman Wheeler’s proposed rules are both common-sense and historically appropriate.